Marriage Supporter — LGBT extremists did everything in their power to prevent us from completing the #FreeSpeechBus tour to promote a national conversation on the biological nature of gender – including engaging in violence, property damage and acts of intolerance, as well as coordinating with anarchist groups – but I'm pleased to say that we overcame them and completed the tour this morning in Washington, DC. NOM joined with CitizenGO and the International Organization for the Family (IOF) to sponsor the tour as a way of provoking a national discussion about the biological truth of gender and to hit "pause" on the headlong push by the left to redefine gender based on "identity" and "feelings." Throughout the tour we encountered the ugly side of the LGBT movement, which repeatedly engaged in violence and assault, and inflicted substantial property damage, in a failed effort to derail the bus tour. Shockingly, we also discovered the deep coordination that exists between Democratic politicians, LGBT groups and extremists, including anarchists who are bent on destroying civil society. One of the major developments uncovered by the tour was how closely prominent Democratic politicians are in coordinating with LGBT extremists and their active participation in promoting activities that result in violence and hate. What we encountered throughout the bus tour was a sustained, violent, coordinated attack designed to shut us down and force us to just go away. They failed to stop the tour or silence us, and, ironically, in the process made our very point that they don't want to debate the issues and instead will use force and political power to silence Christians and all Americans who understand that biology determines gender. Sadly, this kind of behavior is not limited to public demonstrations such as promoting our bus tour. Average Americans are routinely subjected to acts of intolerance whenever they speak up in defense of the obvious truth that gender is determined by biology and that nobody can change their gender. 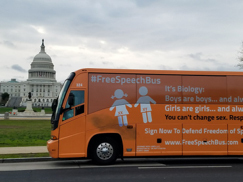 The #FreeSpeechBus tour demonstrated in clear and stark terms why it is essential for Congress to move forward immediately to pass the First Amendment Defense Act, legislation which would prevent the federal government from discriminating against people of faith based on their views of gender, marriage and similar matters. No American should be subjected to discrimination or harassment by the government simply for standing by their deeply held beliefs about marriage, gender and human sexuality. PS — The #FreeSpeechBus tour was a taxing and expensive undertaking. We would be grateful if you'd make a financial contribution to help us recoup and replenish our coffers. Thank you.